As Wichita prepares to debate the desirability of a sales tax increase, a public opinion poll finds little support for the tax and the city’s plans. Only 28% say the city has been spending efficiently. 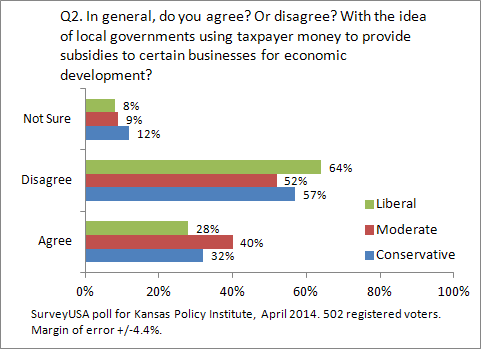 Only 34% agree with the idea of local governments using taxpayer money to provide subsidies to certain businesses for economic development. 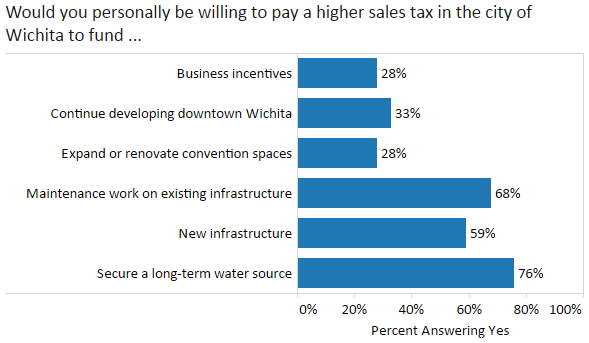 When asked whether they would personally pay a higher sales tax to pay for certain things, there was majority support for securing a long term water source, maintaining existing infrastructure, and building new infrastructure, but one-third or less would pay a higher sales tax for business incentives, developing downtown Wichita, and expanding or renovating convention spaces. 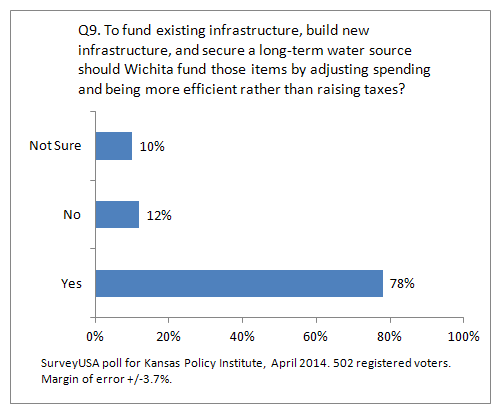 78% said that to fund existing infrastructure, build new infrastructure, and secure a long-term water source Wichita should fund those items by adjusting spending and being more efficient rather than raising taxes. More detail on these results follows. 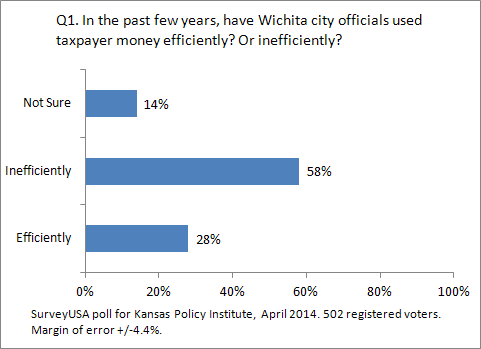 The first question the survey asked was “In the past few years, have Wichita city officials used taxpayer money efficiently? Or inefficiently?” Following are the results for everyone, and then divided by political party and political ideology. Overall, 58 percent believe city spending was inefficient, compared to 28 percent believing spending was efficient. The results are surprisingly consistent. 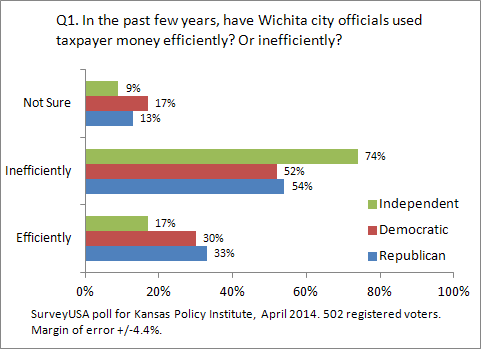 An exception is that political independents strongly believed that city spending was inefficient. 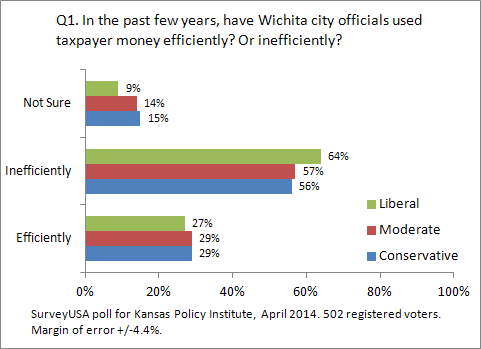 Those identifying as liberal were more likely to say that city spending was inefficient. About one-third of voters polled support local governments using taxpayer money to provide subsidies to certain businesses for economic development. The second question the survey asked was “In general, do you agree? Or disagree? With the idea of local governments using taxpayer money to provide subsidies to certain businesses for economic development?” Following are the results for everyone, and then divided by political party and political ideology. 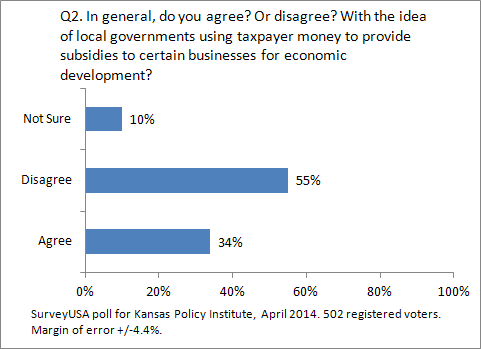 Overall, 55 percent disagreed with using taxpayer money to provide subsidies to certain businesses for economic development. 34 percent agreed. The results are fairly consistent across political party and ideology, although Republicans are somewhat more likely to agree with using taxpayer funds for economic development incentives, as are those who self-identify as political moderates. Voters are willing to pay a higher sales tax for fundamentals like infrastructure and water supply, and less willing for business incentives, downtown development, and convention centers. 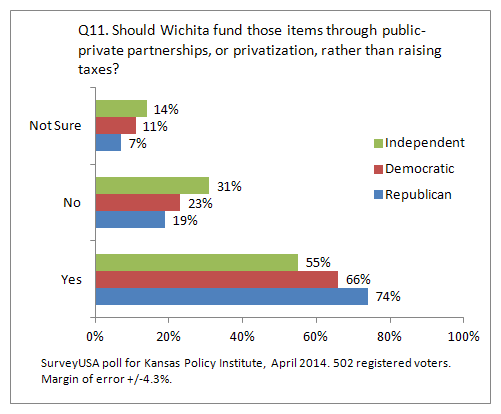 In a series of questions asking if Wichita voters would be willing to pay a higher sales tax to provide certain services, a pattern appeared: Voters are willing to pay for things that are fundamental in nature, and less willing to pay for others. As can be seen in the nearby chart, voters are willing to pay for infrastructure, and more willing to pay for maintenance of existing infrastructure than for new infrastructure. Voters are most willing to pay for securing a long-term water source. For business incentives, downtown development, and convention centers, Wichita voters express less willingness to pay higher sales tax to fund these items. For the first three items, the average was 68 percent of voters willing to pay a higher sales tax. For the last three, the average is 30 percent. Would you personally be willing to pay a higher sales tax in the city of Wichita to fund incentives to businesses expanding in Wichita or moving here from other states? Would you personally be willing to pay a higher sales tax in the city of Wichita to fund maintenance work on existing infrastructure, such as sewers and roads? Would you personally be willing to pay a higher sales tax in the city of Wichita to fund new infrastructure, such as new highways and passenger rail connections? Would you personally be willing to pay a higher sales tax in the city of Wichita to continue developing downtown Wichita with apartments, businesses, and entertainment destinations? 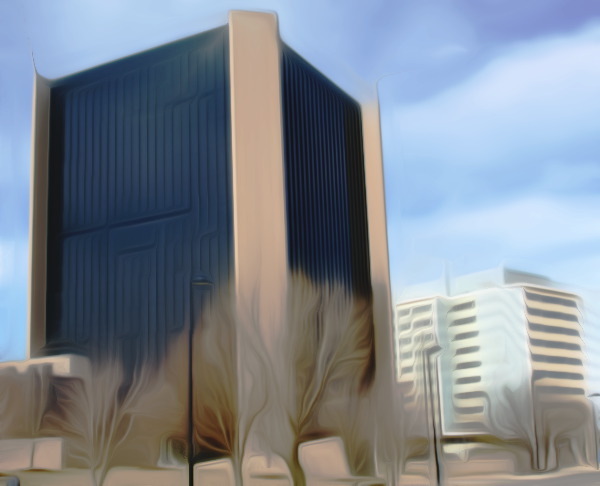 Would you personally be willing to pay a higher sales tax in the city of Wichita to expand or renovate convention spaces, such as the Hyatt Hotel and Century II? 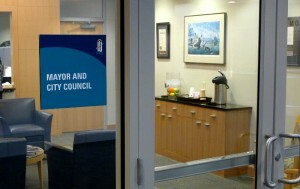 Would you personally be willing to pay a higher sales tax in the city of Wichita to secure a long-term water source? 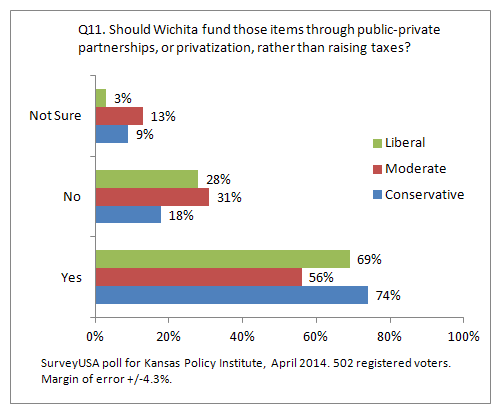 Wichita voters prefer adjusting spending, becoming more efficient, using public-private partnerships, and privatization to raising taxes. 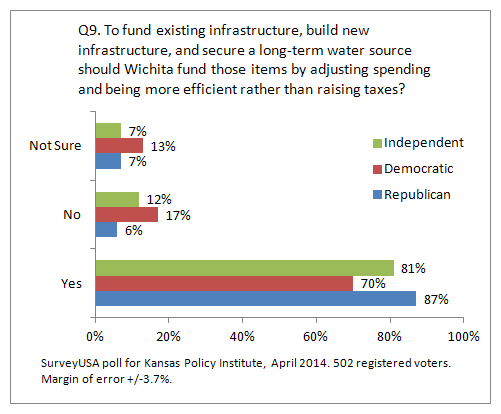 Overall, 78 percent of Wichita voters answered “Yes,” meaning they prefer that Wichita adjust spending and become more efficient. 12 percent answered “No,” meaning they were in favor of raising taxes instead. 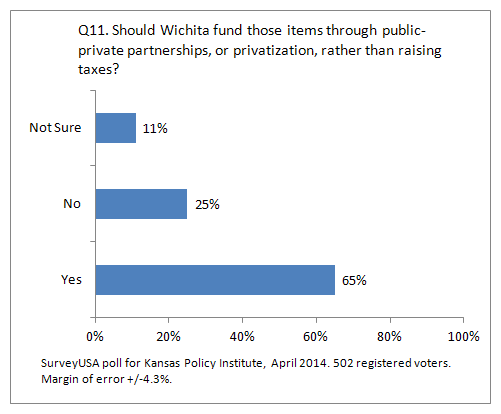 Overall, 65 percent answered “Yes,” meaning they prefer public-private partnerships, or privatization. 25 percent answered “No,” indicating a preference for raising taxes.